What is the ID Check? 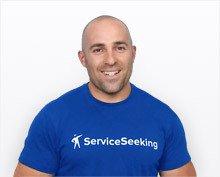 We check the identity of every business and business contact person on ServiceSeeking.com.au. This includes a check on the company’s ABN as well as the contact person’s name and address. Why do we do an ID Check? 2. Agree to quote only on jobs that you’re qualified to do. 3. Enter your Australian Drivers Licence or Australian Passport Information. 4. Add your licence number if your industry requires one. 5. Register your credit card details. Are my ID documents safe? Yes. We store all documents securely and do not make them public. Check out our Security Fact Sheet for more information. You can go here to apply for one. If you have all your information ready to go (i.e. your tax file number and business details), your ABN should be issued immediately. What if I don’t have an Australian Drivers Licence or Australian Passport? You can email a clear copy of your primary and secondary document to support@serviceseeking.com.au for manual ID verification.